The compromise in both playing feel and sound may be just too much for all but the most dedicated practising player. Compact size and weight, bearing in mind that it’s a full-scale electric guitar. The lack of mass affects the playing feel and sound. Tuning is fiddly, re-stringing even more so. Traveler Guitar’s roots date back to the inventor Leon Cox, who, as the website explains, “conceived and built the very first Traveler Guitar in his garage in Redlands, California in October of 1992”. Some of you might remember that, and how it utilised the diaphragm of a stethoscope in its body “to provide the player with a battery-free, private listening experience”. To cut a long story short, by the end of the 90s demand was so high that Fender, no less, took on Traveler manufacturing in its Corona factory before it moved overseas a short while later. The very futuristic electric Speedster soon followed (and still remains the best-selling model), while our Travelcaster Deluxe was launched in 2017. 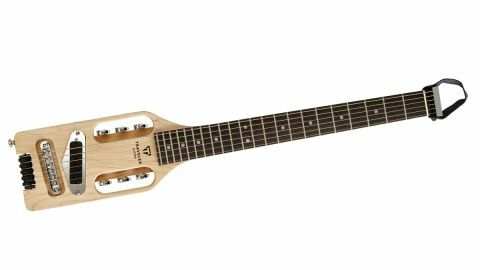 Traveler states that the Ultra-Light Series is “the smallest, lightest, full-scale travel guitar in the world” and we’re not going to argue. This headless design knocks a few more inches off the length - it measures just 28 inches - and the tuners are housed within the body (actually on two screwed-on blocks), while the strings pass over plastic rollers at the end of the minimal body, over a standard roller saddle tune-o-matic bridge and onto the aluminium anchor block placed behind the nut at the tip of the neck. The body and neck are a single piece of maple, a shade under 20mm thick, capped with an unspecified rosewood-ish looking fingerboard. Strap buttons are provided as well as a push chromed metal leg rest for seated practice. The Ultra-Light is a far from a conventional drive, even with its leg-rest inserted. While the neck and fretboard are quite normal like the Travelcaster, the lack of mass doesn’t make for a playing experience that’s any easier. Yes, you get used to it - up to a point - but it takes some time and a lot of adjustment. Likewise, the tuning. The body-placed tuners aren’t the easiest to use and you really do need to stretch the strings. While doing so we broke one, and if you thought a Bigsby was a pain to restring, this in another level of pain altogether. There’s less body and sustain to the sound here, too, although, to be fair, the humbucker - with a nicely bright and spanky voice and certainly with some gain - resembles an electric guitar. Unusual, yes, but with the large choice of good sounding amp/effects apps, all you’re going to need is your smartphone. You could certainly pack the Ultra-Light into a small suitcase or carry bag... as long as you haven’t closed the airport because security thought you were carrying a weapon, of course. If you need small - but not in-scale length, fret complement or neck feel - Traveler Guitar certainly has a big and diverse range of electrics, electros and even acoustics with which to tempt you.